Here's some beautiful cards to perk you right up today! But hold the coffee, they're all about tea. 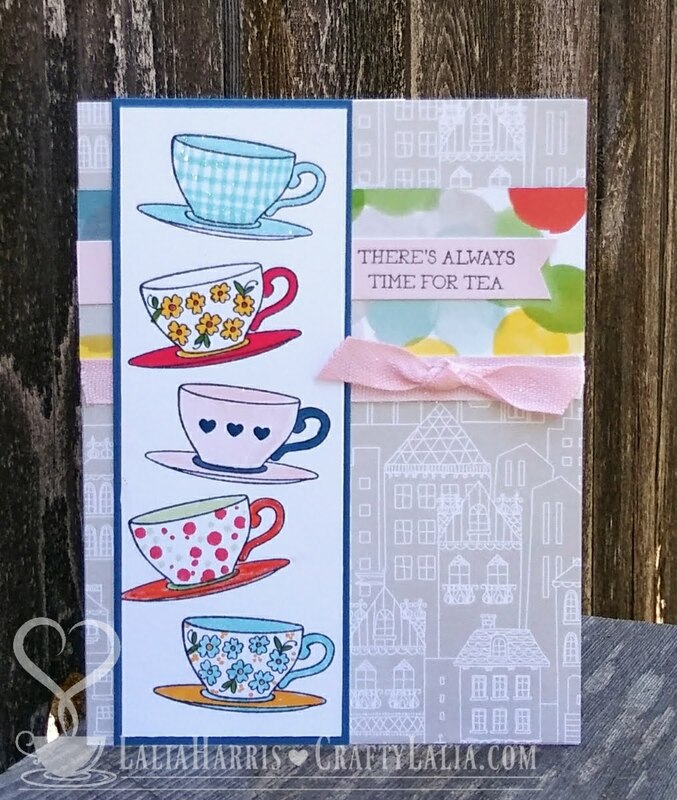 The Beautiful Friendship paper pack was very tea themed, it even had a whole sheet of paper with beautiful teacups. But today, I'm taking that coordinating stamp set Beautiful Friendship - Cardmaking C1720 and using it with other papers featured in the Seasonal Expressions 2 catalog. This first card features the lovely Documented paper suite. Documented does not explain how beautiful this paper is with the purples, pinks and golds mixed with greys. If you looked at the scrapbooking kit and coordinating stamp set you'd see why it's called Documented. I stamped the teacup and sentiment on one of our new stitched Thin Cut Circles. Don't forget about our rose embossing folder that I introduced nearly a year ago. It's still available! This second card is from the Central Park paper suite. It's so whimsical with houses, watercolored dots and bright colors. I stamped the tea cups and then colored them in with our Shin Han markers and various stamps. It was a lot of fun to make each one unique. With joy in my heart and coffee (not tea) in my cup, have a great day!